Lapsang Souchong, Darjeeling, English Breakfast, Earl Grey... What could be lovelier than a nice pot of tea and a plate of scones with clotted cream and raspberry jam? Our tea cozies are a new twist on the classic. With hand-hooked faces and complementary fabric backs they're warm and sturdy enough to keep your tea piping hot. But each of our tea cozies is also outfitted with removable quilted liner, stitched by machine with finished hemming by hand, and fitted to the individual cozy's shape. This liner is completely washable and designed not only to keep your tea extra hot, extra long but to absorb any drips and drops from the spout, thereby keeping the outer cozy nice and clean. Teapot sizes and configurations vary, naturally, so choose the size that best suits your teapot. Small cozies are approximately 10" x 10" and made to fit two-cup teapots. Large cozies are 14" x 18" and fit four-cup teapots. Our favorite green teapot, used in the pictures to provide scale, is a generous two-cupper. As always with our designs, each is unique. We will create similar patterns along certain favorite themes but since each design is hand-drawn, no two are ever identical. Winter is HERE and you know what that means: warm mugs of tea, coffee and hot chocolate. 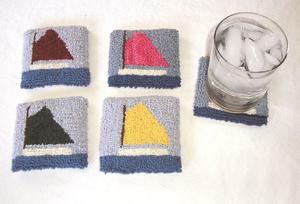 Protect your tables in style with our 4"x4" hooked coasters. Each set of four offers a single design theme with variable color combinations just for fun. We stock coasters of some of our favorite images, like the flock of sheep and Rainbow Fleet (pictured), but we've also been called upon to produce custom images like a herd of Holsteins, a bouquet of sunflowers, even a bridge set. 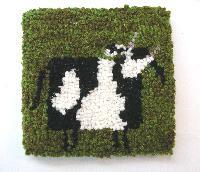 These custom images cost no more than our stock coasters as all our designs are hand-drawn originals. 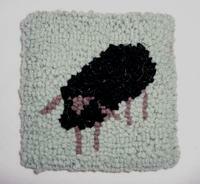 The wool loops are absorbent and colorfast. 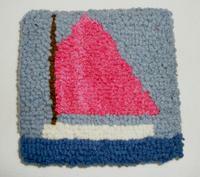 All coasters have a hand-stitched felt backing to provide the softest possible surface for your delicate furniture. 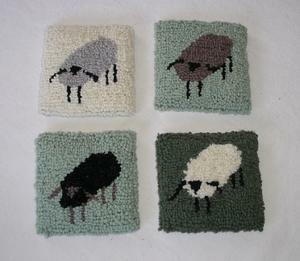 Not all sheep are white of course so we celebrate the many natural colors of our ovine friends in this coaster set. You may order a set of just one color if you like, no extra charge. Rainbow catboats are a familiar site every summer in Nantucket Harbor. This set of four includes red, yellow, pink and green sails. You may order a set of your favorite color(s) at no extra charge. If you would like your own herd, just let us know. 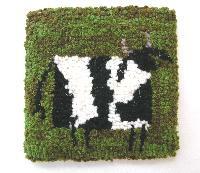 The client, an American folk art aficionado, saw our sheep coasters and asked if we could do cows. Here is the result! 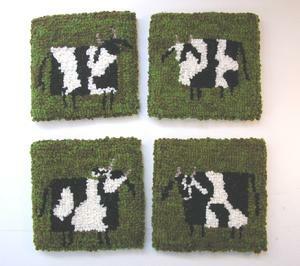 This custom Herd of Holsteins was hooked with a combination of single and over-dyed wools. Background colors can be varied depending on your design needs.